The window for creation of a new machining operation is opened by pressing the button. 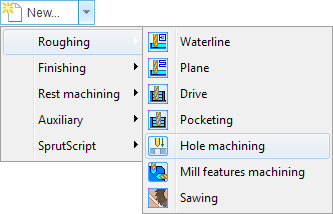 In the <Operation type> area the user can select the type of the machining operation required. All operations are divided into three main groups: <Roughing>, <Finishing> and <Rest milling>. When a group is selected, the available operations in that group are displayed. The number and the type of available operations depend on the configuration of SprutCAM being used as well as on the selected machine tool type. The roughing operations enable removal of workpiece material, which lies outside the model being machined taking account of any restricting boundaries. Normally, the roughing operations are used for the removal of stock material where the shape and dimensions of the finished model differ greatly from the shape and dimensions of the workpiece. The finishing operations perform machining of the final surfaces only, without workpiece material removal. When selecting the <Complex> or <Plane optimized> menu items, the system will create two adjacent operations with 'linked' parameters. The finishing operations are normally used for the final clearance of a models surface(s) after previous machining (e.g. roughing). They can also be used if the workpiece and final model do not differ too much or if using a workpiece made of soft material. The remachining operations allow the user to perform machining only in those areas where material has been left after previous machining operations. The rest machining strategies are identical to other strategies; except that different default values are set. The roughing remachining operations perform removal of the entire volume of residual material, and the finishing ones, machine the actual surface of the model only in un-machined areas. The rest milling operations allow the user to optimize machining for complex details. They are designed to be used for roughing or finish rest milling using a tool of a different shape or smaller diameter than the tool used in previous operations. The operation of spatial transformation (offset) of the toolpath is also included in the rest milling operations group. The type of operation can be selected from the list in the <Operation type> panel. When an operation is selected from the list, the text in the <Operation type> panel (right side of window) is updated. A default comment is added (<Comment area>) and the help graphic changes. The <Comment> can be edited by the user. User may copy similar parameters from other object: parent operation, default parameters or other operation. Object for copying parameters may be selected from <Fill parameters> panel. 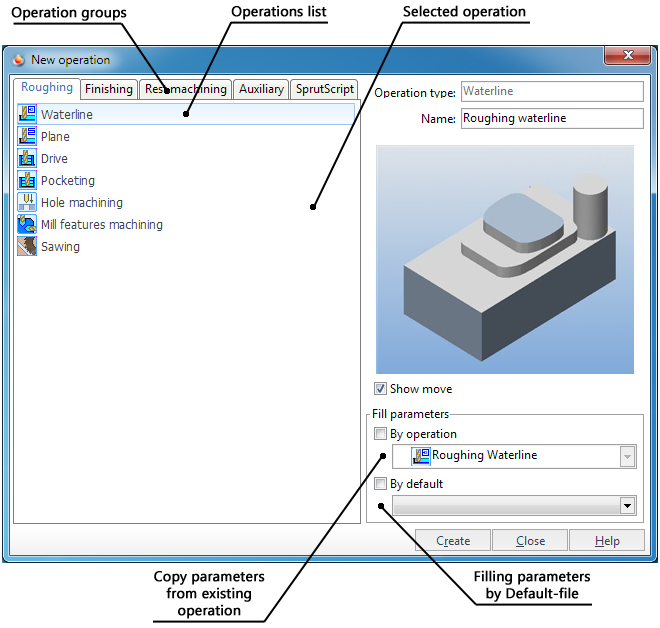 Double-click on the operation types list item immediately adds the appropriate operation to the machining sequence while leaving the dialog stays open. Closing the window using the <Create>button creates a new operation of the selected type with parameters assigned. The parameters are assigned either by default, depending on the operation type and the geometry of the model being machined, or copied from an existing operation. This means that the new operation is ready to be calculated and does not require the input of many values. In most cases it is a simple matter of adjusting a few parameters based on the particular model being machined. The newly created operation becomes the current operation, and is available for editing and execution. There is also a more quick and easy way to create a new operation. To create an operation, you can click the arrow next to and choose from the menu the desired type of operation. This kind of operations creation significantly speeds up the work because eliminates the need to open and close the window every time.